You know how sometimes you turn around and the person who's been there all along is the one you end up wanting? That's how I'm feeling about eggplant right now. Who knew it was so full of flavor, and that it would develop such an irresistible, almost buttery texture when grilled? That it would melt on the tongue like that? Clearly I didn't know what I was missing. I made pesto the other night (something I've been meaning to do forever, since buying dairy-free pesto is usually not possible, and when it is, it is not cheap). So far, I've made pesto chicken wraps, and I've had some on pasta. And tonight, I threw some on the grilled eggplant I had just made. And just for good measure, threw some Daiya Vegan Cheese on top. And oh, my God. Heaven. This is a super easy dish to make, and if you eat enough of it, it could totally be your dinner! But it would also be an excellent appetizer, and just fancy enough in its simplicity to be party food. It takes less than 15 minutes to put together - but I swear it won't taste like it. Heat a nonstick pan with cooking spray. Place the sliced eggplant over medium heat and fry for about 4 minutes on each side, or until it's browned on the outside and soft on the inside. You can do this next step either while it's still in the pan, or you can use the oven or microwave. Spread some pesto on each slice of grilled eggplant and sprinkle with Daiya Cheese. Heat until it melts. You can either make them into little eggplant sandwiches or leave them open-faced. Serve immediately. "There's something very summer about cherries," someone at work said to me this week. I couldn't agree more, and what perfect timing he had, because there just so happened to be a sale on cherries this week. Organic cherries, at that. And conditioned by years of watching my mother stockpile groceries, I followed my instincts. I came home with 5 pounds of dark red cherries, glistening with matte condensation. Ambitious as I may be, I can't eat 5 pounds of cherries before they go bad. I needed to find some way to use them, or at least to preserve them. So I started pitting them (my fingers are still slightly purple), and one episode of Gilmore Girls later, I had a mountain of halved, pitted cherries sitting in front of me. Begging to be used, and pleading with me to infuse something baked with their tart sweetness. The flavor combination was easy, because cherries go beautifully with almonds. Theirs is sort of a famous little affair. So it was really just a matter of finding the medium I was in the mood for. In the end, I settled on muffins. Whole grain muffins, specifically, and ones that would use less fat. Muffins I could eat a few more of without feeling guilty. Which turned out to be a very wise choice in this case, as these muffins turned out to be heavenly - a little too heavenly for comfort, actually. Mine turned out to be pretty moist, which is partly due to the substitution of applesauce for some of the oil, and partly due to the shredded zucchini and squash (I used half zucchini and half yellow squash simply because that's what I had in my kitchen, but you should feel free to use all of either, if you only have one or the other). The fresh chopped cherries add a tart sweetness, the perfect complement to the almond flour and extract. The bottom line is that they're fabulous, and would be wonderful to eat any time of day (I, um, may have turned them into my dinner tonight). So next time you find yourself wondering how to use those cherries you just bought, try this recipe out. And I dare you to stop at just one. Preheat oven to 350 F. Line a muffin tray or spray with cooking spray. In a small bowl, combine the flours, baking powder, baking soda, salt, and cinnamon and mix well. In a separate bowl, mix together the oil, applesauce, shredded zucchini/squash, sugar, egg, flaxseed meal and water, and vanilla and almond extracts. Add the wet ingredients to the dry ingredients and stir to mix. Add the chopped cherries (with as little of the water as possible) and stir to mix. Divide the batter evenly among the 12 muffin tins. Bake at 350 F for 25 - 35 minutes, or until a knife comes out clean. These end up being very moist even after baking for a long time, so definitely take them out after 35 minutes. I've had a couple of attempts at granola bars recently, mainly because they can get so expensive to buy at the store. So far, mine have mostly turned into granola because they just won't flippin' stay together long enough to be called bars. I won't claim that these are the sturdiest of bars. But as you can see, they stayed in the shape of bars long enough to be photographed. So that's something. They actually stayed bars all day, especially if they were in the fridge. I don't think they'd necessarily survive a long hike in a backpack (at least, not without some serious tupperware protection), but they have definite potential for someone who is looking for bars for light use. I know I'll be making them again. And they are really, really tasty. A friend of mine had sent me a link for Grain-free Granola Bars, and I thought, why not? It fits in with my general pursuit of bars at the moment. But I'm not grain-free, nor did I want to rely solely on nuts for my bars. So I adapted it and added some finely ground-up honey nut chex, and more honey than what was originally called for. I also studded mine with some crushed chocolate chips because.....well, I don't have a reason, actually. Because chocolate is never a bad thing to add. If you want a stickier bar, feel free to add more honey, or maybe some agave nectar or maple syrup. Experiment with your own favorite combination of nuts, seeds, and dried fruit. Go with Cinnamon Chex instead of Honey Nut. Make these your own! *You can double this recipe for thicker bars, or for a 9 x 13 pan. Don't preheat the oven. They're no-bake - yay! Line an 8 x 8 pan with a sheet of wax paper (believe me, you'll want to have that paper there or you'll never get these out of the pan whole). In a large bowl, combine the ground chex, almond meal, ground sunflower seeds, salt, ground flax, chia, and sesame seeds, dried cranberries, and the shredded coconut. In a small saucepan, heat combine the honey, coconut oil, vanilla, and cinnamon. Heat over low-medium heat until melted and it starts to bubble. Pour over the dry mixture and stir well to coat. Pour it into the pan and if desired, sprinkle the chocolate chips over the mixture (they might melt a little if it's still warm from the honey/coconut oil). Using another piece of wax paper, press it really hard into the pan. Like, really hard. Remember, you want these to become bars! Refrigerate for at least 4 hours or overnight. When ready to eat, remove the wax paper from the pan and cut into bars. Store in the fridge so they stay in bar form. 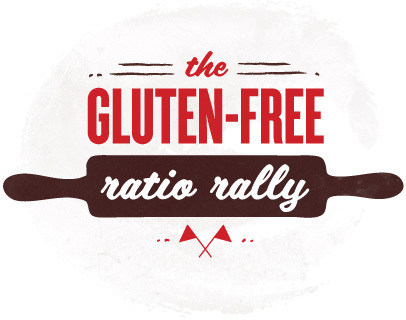 Sadly, this month was a little too busy for me to participate in the gluten-free ratio rally. I had one feeble attempt at pasta a few weeks ago and then time slipped away from me until it was too close to the deadline to start over. But despite my own failure to participate, you should definitely head over to Jenn's blog, Jenn Cuisine. Jenn hosted this month's event, and her recipe for Tagliatelle with Smoked Salmon can be found here. Pasta rocks. We all know it. And that's all the more reason to go and check out all of the amazing recipes that people came up with this month for gluten-free pasta. Pasta we can not only eat, but make in our own kitchens! I encourage you to check all of them out! And join us next month for cakes with Kate of Gluten-free Gobsmacked hosting. Here's a super simple meal idea for dinner, and a way to use some leftovers. Make a batch of Savory Dinner Crepes and melt some Daiya Vegan Cheese onto it while it's heating in the pan. Heat up pretty much any random leftovers that sound good to you (I had some delicious Sweet and Tangy Cherry Apple Meatballs from the previous day) and use them to fill each crepe once the cheese is melted. You could load the crepes with roasted vegetables, or with any meat of your choice; with cheese and fruit; with taco meat; with beans; with whatever your heart desires/whatever your fridge contains! Once they're filled, fold over; eat. So fast, so simple, and totally delicious. So simple I won't even put it into recipe form. This is a purely prose recipe. And these wraps are so convincing that they won't even crumble if you refrigerate them for a few days; they still bend. Enjoy the dinner mix and match! I'll confess that granola is not actually what I set out to make yesterday. I was trying to make snack bars. You know, the kind that, uh, don't fall apart when you try to eat them. But this turned out to be an ambitious goal. No matter how much honey I added, they stubbornly refused to stay together in bar form. But that's ok. I was putting too much pressure on them to be something they're not. This was a granola recipe from the beginning. I see that now. And once I just let it be granola, it all fell into place. At first I was going to call this Blueberry Muffin Granola, but when I shared it with two of my friends, they immediately said it tasted more like cobbler. Which makes sense, since it probably shares more ingredients with cobbler than muffins. But, the point is really that it will taste like a delicious baked blueberry dessert of some kind, and you'll probably have a hard time not eating all of it from the pan. I had originally added only 1/4 cup of honey, but after baking them for about 20 minutes, it was clear that the mixture was too dry to stay together in bar form. So I added another 1/4 cup in the hopes that this would help - but it didn't. And then I ended up with really sticky, soft granola. Which, again, was delicious, but feel free to adjust the amount of honey according to your own tastes, since it's not going to stay together anyway. I'm sure this would be wonderful with other add-ins - maybe some flax or chia seeds, or nuts, or a different combination of dried fruit. Go crazy if you feel like it. But if you're a blueberry fan, stick with what you know. You won't be disappointed. Preheat the oven to 350 F. Line a 8 x 8 pan with foil and spray lightly with cooking spray. In a large bowl, toss the oats, coconut, blueberries, salt, and cinnamon together. Combine the wet ingredients in a separate bowl and mix together lightly, then toss with the oats. Spread over the pan evenly and place in the oven for at least 30 minutes (for a softer granola) and for up to 50 minutes (for a crunchier granola). Stir around every 10 minutes or so, and remove when you're happy with how browned it is. Store in the refrigerator until ready to eat. If there's any left.